Have you heard of that saying Never Say Never? I had too. But until recently, I never really thought much about it, and definitely did not ever consider applying it in practice. In-fact I am known to use the word pretty liberally. And one area where I know I have used it way too often is on the topic of doing paid book reviews. I was determined to ‘never’ do them. Not because I had anything against the concept. And definitely nothing against those who did it. Reading and reviewing books took time and effort, and if people felt the need to be compensated, I completely understood it. I just personally felt it wasn’t for me. I wanted to read for pleasure, and be free to review (or not), and share my thoughts as I deemed fit. Now nothing much of the above has changed, outside of the fact that I am now accepting paid book reviews (and I’ll explain in a bit). But before I get into the details, I just want to share the why. What changed, and why I have now decided to take on paid book reviews. Well mostly it’s a time thing. But it’s also due to some pretty drastic changes in circumstances. When I originally started my book blog, I was a stay-at-home mom, who blogged about books as a creative release. However, over the past three years, a lot has changed. I started working full time as a Digital Content Marketer. In addition to starting another food blog – The Love of Spice (among several other projects). This resulted in a severe time crunch for me, and I had to prioritize my tasks, and the projects I took on. The other thing that changed was the sheer volume of review requests I started getting. I used to get one, maybe two review requests a month. And now, on an average I get one review request every other day. About 15-20 books a month. Now clearly I don’t accept most of those books for review. But even if I accept just 1-2 books a month, in addition to the books I want to read for pleasure, and all the other things I need to get done, it gets really overwhelming, and stressful for me. And the last thing I want is for reading (or reviewing for that matter) to cause me additional stress. Because for the longest time, books have been my favorite way to de-stress, and I want to keep it that way. At the same time, I also need to be cautious about the time I spend away from my family, because I already work full time, and have two blogs to run. I cannot afford to spend more time away that I don’t absolutely need to, reading and reviewing books that I might or might not have picked up on my own. And that’s the other aspect of this whole production. Accepting books for review is always a gamble. Some of them turn out great, but others are minor disasters to say the least. And then I end up putting all the time and effort in reading and reviewing them anyway, because I have given my word to the author, and I like to keep it. Which is nice and all, but cold comfort when I feel guilty about not doing higher priority tasks just to make time for this. Because here is the thing, when I look at the big picture, and consider the time and energy I put into reading and reviewing books, I just cannot justify it. Nor can I justify letting the books I really want to read, lie unread, as I work towards the review commitments. 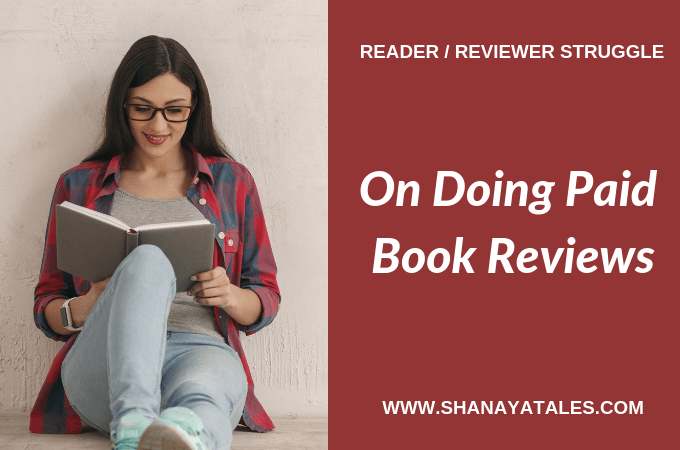 So this is what I have decided to get some semblance of control back when it comes to reading and reviewing books – Going forward I am going to mostly only (most only, not only only 😛 – explanation further down) take on paid book reviews. I am sure this will do one thing, if nothing else – it will instantly bring down the volume of review requests, which is great for me, at the moment. Because it will free up my time, and a lot of mental energy. I am assuming (or rather, hoping) that this will also weed out quality issues. But if it doesn’t, I have decided on some measures to ensure the quality of books I do end up taking up for review (details in the highlights below). Now of-course I will be writing a proper book review policy, and having it published on the blog soon, but in the meanwhile, I wanted you guys, my readers, as well as the authors who follow my blog, to know the thought process behind the change, and also a little of what to expect from the policy, which is going to be published soon. 1. First, let me address, the ‘mostly only’ thing I mentioned above. So like I said, going forward I will be mostly only taking up paid book review projects to justify the time and energy I put into it. But I will also be reviewing some books for free. Especially the ones by my friends. Or the ones I choose to. 2. If you are a new-to-me author, then I’ll require a sample of the book (first 25 pages, or 3 chapters) to decide whether or not I’ll take up the book for review. Trust me, this will save us both a lot of heartache. I would be able to take an educated guess as to whether I would like the book (because sometimes blurbs are not enough) and it will reduce the chances of a negative review for you, if I do end up taking on the review request. 3. Speaking of which, if we do decide to work together, please know that I will be disclosing the fact that it is a paid review, in my review, on every single platform I review it. 4. On a related note, I will always publish the review on all the promised platforms. But in case the review is negative, and you would rather me not publish my review, I will refrain from publishing it. But under no circumstances will I change my review. 5. The review charges are compensation for the time and energy I spend in reading and reviewing your book. And not payment for a positive book review. That is one thing I cannot guarantee. I can promise an honest and fair review, even a kind one, but not a positive one. That’s all from my end folks. I would love to hear from you. 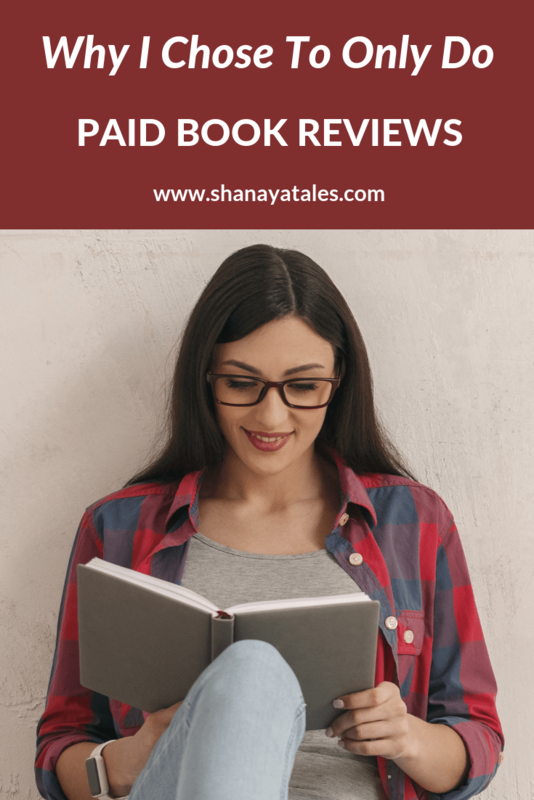 What do you think about paid book reviews? All positive and negative opinions are welcome (so long as they are politely worded), because I know, I have been on both sides of this argument, and I kind of understand both point of views. But (whether you do paid book reviews or not) do share your thoughts, because your opinions are valuable to me as they will help me draft a well rounded book review policy. And especially if you do paid book reviews, I would love to hear about your experience (in the comments, or via private/direct message on Facebook/Instagram, if you are more comfortable with that). Because I am sure there is something I have not thought of, as I am so new to this. Which is why I would really appreciate any comments/suggestions/advice you have for me. P.S. Please know that nothing changes for all the book review requests I have already accepted. I honestly think I should start doing paid reviews as well. I’ve do much on my plate and so many commitments that I just cannot do free reviews anymore. I know, right? This is why I have been considering this from a long time, but procrastinated it, because I worried too much about the implementation etc. But I cannot do this any longer. For my own sanity, I cannot keep on taking on the many review requests for free. As you know I don’t review books. But if I did then paid book reviews would be my choice. Because as you said it is time consuming. And the reviewer is supposed to read the entire book whether he/she likes it or not and give an honest feedback. If I request someone to review my future book, I think I should pay for their service. Nothing in this world is free then why is it not applicable to reviewing books which helps the author! And yes, paid book review definitely doesn’t translate into a positive one. All the best, dear. I’m in awe of you, doing the many things you do with such perfection! You are incredibly kind, Vinitha. And I don’t think I can ever thank you enough for all the love and support. Thank you for being there, always! The title was tempting enough. Of course, it will be great to do paid reviews especially since we have so much to read and so little time. I love the 5th point about doing reviews and not ‘positive’ reviews. I hope this becomes the norm too rather than an exception. All the best Shantala. Thank you, Lata. I have resisted this for the longest time, maybe because I always equated paid reviews with positive, promotional ones. Which is also why, I wanted to clarify this right at the very beginning. Iam now sailing in the same boat as you. Iam getting a lot of review requests and iam not getting time to review even one or 2 a month. I completely understand your take on paid book reviews. I might not take that route yet but I agree with you. Thank you, Ramya. I understand where you are coming from. I have been in the same boat from a long time. But now it’s getting overwhelming, so for my own sanity, if nothing else, I had to do this! Wisely Said Shantala. Most of the books I review are my personal choice, cause reading is still a passion for me. I do paid reviews too, and clearly mention in my communication that I would’nt mince words, and would do a fair judgement of the book. The compensation is indeed for the time spent in reading and writing out my opinion. A lot of authors especially newbie ones or who are on a tight budget, back out. So the ones who do agree, I have noticed, have a fairly decent plot and readable content. I loved the way you have laid out the policy , concise and drives the point in. Thank you so much for the feedback, Ramya. I was concerned whether the pointers were clear enough, as I have had many bad experiences with authors in the past, even when I never charged for reviews. So thank you for sharing your thoughts! Your point about asking for a sample of the book is very wise. Happy reading and reviewing! I already do paid reviews and have no guilt in it. Payment is ofcourse not for a positive review. But for the time, effort and mostly the blog post. We pay for maintaining our blog right, so publicity posts are no way going free on the blog. That’s how I think. Even I do not have a published review policy on my blog. But I will be updating it soon. Yes, I completely agree, Maya. Thank you for sharing your thoughts on this. This sounds very straightforward and simple to me. I have nothing against paid reviews as long as that is disclosed, and I also appreciate the point about the payment being in lieu of time and effort, not as a guarantee of a positive review. All my good wishes: I hope your blog continues to flourish on this new path you’ve chosen, Shantala. Way to go Shanaya – this is why you are one of my fav Book reviewers!! So much sense in this post and I am with you on all these points. I have recently started taking bu book reviews (paid) and am going to incorprate a few of your pointers of getting a few pages to read before hand. Some of these writers are terrible and then I have been stuck with a dead book. I am with you on an honest review and saying that its a paid review! I got flack from one writer over this and trust me her book was dismayal to say the least. She made such a ruckus that I removed ny Goodreads raitng etc but told her I will only publish an honest review – this was unpaid as she was a fellow blogger. God – she was a nightmare and thats when I decided I will charge online peeps and will quote slightly higher so as to get only the genuine ones! As a reader (and consumer), I don’t get influenced by “paid” reviews- be it about books, restaurants or skin-care products. But the straight-forward way you’ve pointed out the reasons, it’s really impressive. You should totally go ahead with charging compensations, as you sound like a pro at what you’re doing. Best of luck. Thank you so much, Jheelam, for understanding, and all the support! This is something that I have been giving thoughts to as well. I have also realized that reading books for reviewing, as a main thing, is taking too much of efforts and it is cutting into my normal reading time, aka reading for pleasure. So I have reduced the number of books I accept for review.While I would love to accept commissioned work, I don’t think I will find a market to it. That being said, I am glad that you have taken such a strong step and I totally approve of it. And if and when I can, I would like to follow your steps as well. Great post. Gayathri recently posted…Eight book covers that made me go – WTF! Honestly, Gayathri, I don’t think there is a large market for it, since so many reviewers do it for free all the time. But in my case, I am okay if I don’t even get one single paid project. As I am mostly doing this to filter & slow down the flow and quality of review copies coming my way. That being said, I know enough people who do charge for reviews, and do have a decent number of projects, so there is definitely some market for it. So I feel like you can (and should) try it out. All the best! Hi Shantala! I believe that reviewers should be paid for the time they take to review books for authors. This is why I pay my video reviewers too. We’re currently hiring reviewers. Oh that’s good to know, Jasveena. Thanks for sharing! It’s probably a smart decision because I think our whole community needs to move towards paid reviews. Every other type of blogger does paid reviews, except for us. It is discouraging. Although I wonder how many inquiries you will get, because there are so many bloggers who are out there and willing to review heaps for free – I guess, at the least it will reduce the amount of review requests you get. I mostly don’t accept anything now and just turn them down (mostly for the same reasons as you). Evelina @ AvalinahsBooks recently posted…“Guilty Pleasure” Labels: Is It Just Schoolgirl Mentality You Can’t Let Go Of? I agree that the market for paid reviews will be really small (even though it shouldn’t be). But in my case, I am fine with that. Because I am mostly doing this to slow down and filter the flow and quality of review copies coming my way. So I’m cool if I don’t work on a single paid collaboration. That being said, I feel like this needs to be more of a norm in our community, even though it isn’t now. Here’s hoping.. This sounds just about right to me. I’ve done a few reviews on my blog but mostly of books by friends. But that was tricky territory. It is so damn difficult to honestly put everything out there especially if you know a person. So, I’ve stopped doing those too. I only review books on Goodreads and Amazon. I can understand how tough it is for book reviewers and I am happy that you put everything out there. Reached here while researching for a post on TopBlogs, on India’s best literary blogs, that would come out soon. Three things relate us with you here, so this response. One, looking at your literary resources: that we have done. Two, we used to review blogs for free, and in great details, and by 2014 we had reviewed more than a thousand blogs. That sapped a lot of our energy and so we stopped. So, we know how you feel when you get requests for review in dozens because it is free. Three, we recently published a post on review of products on blogs – hope that resonates with your experience. All the best to you. I have admired bloggers who take up paid reviews so I am on the same page with you on this one even though I haven’t done them myself. In tweets I’ve spoken in support of paid reviews, I’ve always talked about the ‘time’ issue. It is a logical decision indeed. I’ve turned down most of my review requests from as early as July because I knew I’d be busy for the rest of the year. I’ve accepted maybe 3-5 % from them because even though some seemed like my kind of books, I didn’t think I had the time to invest in them (for free). There were others on my shelves that needed my attention too. Also I don’t think anyone should/would give positive reviews for a paid collab because that affects the authenticity of the blogger and in turn the support of the audience. Love your pointers which are loud and clear. I am sure you will do great. Good luck! Thank you so much, Resh. And yes, I can completely relate. I never thought I’d say this, but it’s exhausting business, turning down review requests, just because of the sheer volume of these requests! Also, I used to think that one day I’ll have the time, one day I’ll be sent books for review that I’m really interested in. And the thing is, every now and then, a few books do seem interesting, but still I never seem to find the time. And this has been the case for over a year now. So I don’t think anything is going to change without me changing something. Thank you for sharing your thoughts, and all the support. Hugs. I’d love to do paid reviews but to be honest, if I got books that’d be good enough for me. I think for me, I would only review books I wanted to review and yes, hey would be honest reviews of course. I don’t begrudge anyone who does it for money but I don’t think I’m at that stage yet so free books are good enough for me! Truth be told, I’ll be fine if I don’t work on a single paid review request. And this is very likely, because the market for paid reviews is not huge, and I am still going to be super picky about them. So, very likely this is never going to happen. But I’ll be happy so long as this works for slowing down the flow and filtering the quality of review requests I do get.